Golem best deck! 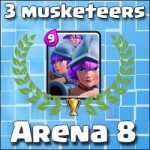 | Clash Royale fan-site! 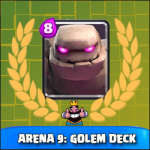 Home » BLOG » Arena 8: the best Golem deck! A huge, durable stone creature that slowly moving to its target and don’t pay any attention to the enemies that are trying to stop him! Yes, that words were about Golem – one of the most powerful epic card in Clash Royale to date that unlocks and becomes available after promotion to Arena 6 Builder’s Workshop. The devs endowed this character with a huge stock of hitpoints (3,200 units / 1st level) and not bad damage power (78 units / 1st level). Moreover, in the moment of his destruction Golem ruptures and divides into two small Golemites, which continue an attack! His explosion causes an area damage (195 units / 1 st level). In a word this is machine that is hard to stop! In this post I’ll share my best Golem deck (with no legendary cards in it) and my experience how to use it in a proper way. So, as I’ve already written, with the skillful and competent use of Golem it’s possible to defeat players of a higher level in Clash Royale! And don’t forget that correctly formed battle deck – it is not a victory yet! Not less important to use it in proper way! As you can see there is no legendary cards in the deck! And now I’ll try to describe in detail why exactly these cards … Based on my experience I can with confident say that the most often cards that players put on arena against Golem are Skeleton Army and Minion Horde (this is approximately in 60% of cases) . Less often, they try to stop “stone creature” with the help of Witch, Wizard, Minions and Barbarians. The other cards uses less. Poison. A very, very useful card in Clash Royale and in the Golem deck especially! Just “throw” Poison on the moving Golem and forget about skeletons and Minions! Also, with the help of this card we can destroy an enemy tower when it has a low hitpoints level or protect our tower from massive enemy attack. Archers. This common card is in my every deck 🙂 An excellent work both in defense and an attack! 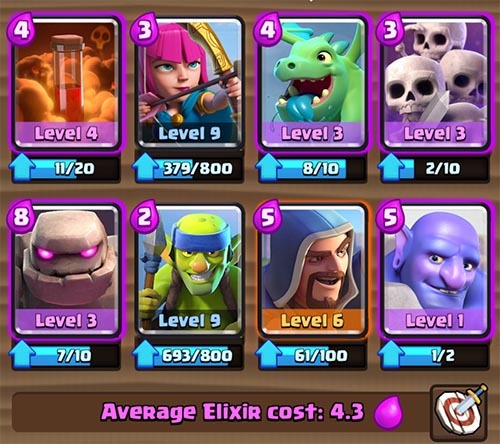 Archers attack every types of characters in Clash Royale that makes this card very helpful. Spear Goblins. Same as Archers. Low cost, an ability to attack every type of targets makes this card useful. Baby Dragon! An excellent way to protect moving Golem from Minions, Skeleton Army, Goblins and even Wizard. Great in defense of own towers. Skeleton Army. 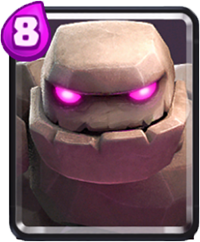 In my best Golem deck the main role of this card is defense! This pile of bones is very good against such units as P.E.K.K.A., Mini P.E.K.K.A., Prince, Giant etc. Wizard. The reason is the same… it’s an ability to hit both air and ground targets. Bowler. Just let him go after the golem and forget about skeletons forever 🙂 I want to tell you that Bowler is a very interesting card that suits Golem deck perfectly. One minus is that this card unlocks on Arena 8 “Frozen Peak”. Thus if you have no Bowler in your disposal you can replace him with Fire Spirits or Furnace. These two cards suits Golem tactic also. And form such deck for yourself! Good luck in Clash Royale! 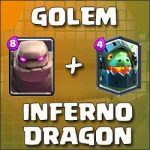 Golem and Inferno Dragon – an unstoppable deck! Arena 9: Great deck for Golem! 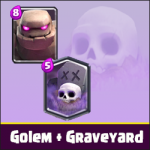 Golem and Graveyard – an incredible attacking power! « 4 new cards, ability to keep 5 decks and more in the upcoming Clash Royale update!